Basic Information: What is Neuro-Natural Recall? 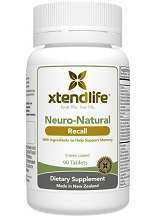 This is a review for Neuro-Natural Recall. Neuro-Natural Recall helps to maintain memory recall and supports healthy function of the neurons in the brain. It also has the ability to support cell activity within the brain. If you have misplaced objects and can’t remember where they are, Neuro-Natural Recall is a product that can help. Neuro-Natural Recall contains many ingredients many of which are inactive. Here is a list of all of the active ingredients. The serving size of Neuro-Natural Recall is 6 tablets to be taken daily. Adults should take 6 tablets daily, teenagers the age of 16-18 should take 4, 12-15 years old should take 3 tablets, and ages 10-11 should only take 2 tablets. For the best possible results the tablets should be broken up into 2 doses daily, one in the morning, and one in the afternoon and can be taken with or without food. One bottle of Neuro-Natural Recall costs $42.50. There are 90 tablets in the in a bottle. Taking Neuro-Natural Recall helps during those “senior moments” when you can’t remember why you walked into a room or you tend to forget important details because your brain is overwhelmed and tired. Taking this supplement has helped me to maintain my focus so I am then able to remember people’s names or not lose my train of thought. It is as if my memory came back and I felt like myself again and I experienced no side effects. According to the manufacturer’s website and extensive online research there are no known side effects or issues with this product that should raise any type of concern. The manufacturer of Neuro-Natural recall have a promise and a guarantee to their customers. If you are unhappy with any product in a 365 day span of time, you can return the product for a full refund with no questions asked. They stand by the quality ingredients that are used in their supplements. Neuro-Natural Recall has the potential to improve your memory while also providing nutrients that your brain needs to be healthy and retain memory. Many of the ingredients in this product come from natural sources. The nutrients that are found in Neuro-Natural Recall are some of the most brain-supporting nutrients available. The dosage states that you must take 6 tablets a day which is quite a hefty number that may be a turn off for some buyers. There was a lack of information found online in the form of reviews so it was difficult to find out whether or not there are any side effects. The product has not been on the market long enough and has not built a relationship for themselves. Should You Take Ginkgo to Protect Yourself from Alzheimer’s Disease? This site is dedicated to providing you with the best information regarding nootropics, brain boosting and optimizing cognitive energy. For those looking to achieve more, be more, do more and increase personal potential, then you are in the right place. Until recently, caffeine was considered one of the most effective ingredients for staying awake longer, boosting adrenaline and enhancing cognitive abilities. However, nootropics, memory enhancers, stacking, smart drugs and brain boosting supplements – however you like to refer to them – have become commonplace with many individuals whether they want to excel in work, at school or simply achieve more within the home. We aim to provide the most comprehensive resource available about brain boosting and how to effectively optimize cognitive energy so that you may reach your full potential and beyond. We provide you with impartial, up-to-the-minute information regarding cognitive energy enhancement and brain boosting. Theories behind boosting our brain’s potential rest on the belief that intelligence is not locked and can be improved or boosted. The brain has an incredible capacity to reshape itself to allow our cognitive processes to be enhanced, therefore providing the potential to significantly improve memory, mental performance, focus, concentration, motivation and energy, to name but a few. Whatever your drive for wanting to optimise your cognitive abilities, we are here to help.